Peacock Feathers and Peacock tail - what does the peacock do with them? 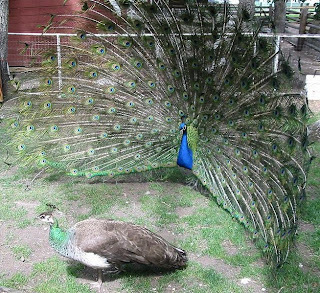 Peacock feathers are used by the male peacock in courtship. It is actually a really interesting thing to watch. The male bird opens up his big tail of peacock feathers he finds the female peacock and shakes his feathers at her. It is interesting to note that the female peacock is not called a peacock but a peahen, only the male is really a peacock (you have to find this at least a bit funny). 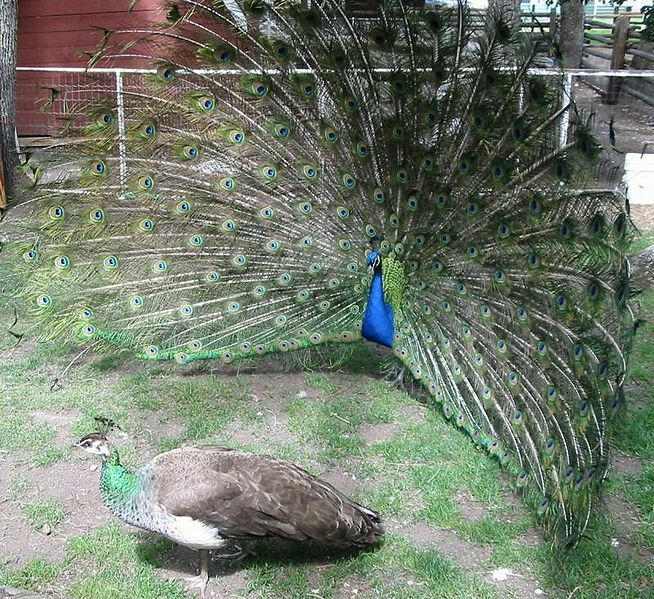 They are both actually called peafowl. The peahen`s feathers are brown or grey brown in color. The peacock feathers are iridescent blue-green and green colored plumage. It is the peacock`s tail that hold the real beauty of the bird. The peacock tail has eyes all over it. And it is the peacock tail that opens up or fans out in order to attract the peahen. When you watch this all happen you can see that the peacock feathers have an almost hypnotizing effect. You would never think it but peacocks can get really violent. Near my house there is a small petting zoo and they have a big bird cage with peacocks and turkey. Now the peacock`s tail would be open and he would be trying to get his peahen. If a turkey was unfortunate enough to walk between peacock and peahen, oh boy would that get the peacock mad. The peacock would chase this poor ugly turkey around and peck the heck out of him. I really thought the peacock would kill the poor turkey. A really interesting thing about peacock feathers is that they don’t actually have as many colors as it appears. Some of the colors are created by what is called optical interference Bragg reflections. A slight change in the spacing results in different colors. For example the brown peacock feathers are actually a mixture of blue and red peacock feathers.